Snow Mold Disease | Fairway Green Inc.
After a snow storm your yard looks pretty and picturesque, like a Bob Ross landscape painting! But underneath this serene scene there is a lot going on with your grass; including dreaded diseases! Snow mold is a fungal disease that can become active on turf under the cover of snow in the early spring. There are two types of snow molds common in New Jersey; pink snow mold and gray snow mold. 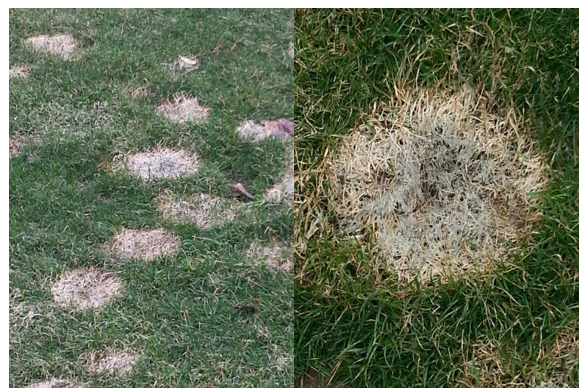 Above are two examples of what snow mold can look like on your lawn. Once the snow starts to melt, pink snow mold disease becomes evident. Pink snow mold gets its name from the pink fungal spores that collect on the grass leaf. These spots will start out straw colored and the accumulation of spores on the grass leaf can become so numerous it starts to produce pink circular spots in the lawn that have a matted down appearance. 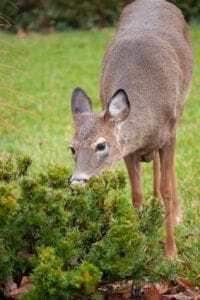 The spots can grow to five inches in diameter and have a bronze border. When there are multiple spots, they can coalesce into larger irregular areas in the lawn. Pink snow mold disease can continue during wet weather if the temperatures are between 35° F and 65° F, with an optimal temperature at 45° F. Pink snow mold does not only occur under heavy snow, the activity also occurs in light rains, heavy dew, overcast skies, fog and most importantly, extended leaf wetness. It can take from forty-eight hours up to seventy-two hours for this disease to start to form. Gray snow mold disease is similar to pink snow mold discussed above, but with a few different distinctions. First being the color of the disease. The patches will start out as a straw-colored spot then turn gray or silver in color. The patches can range from several inches to large swaths of turf. This disease can live in the thatch layer, the crown and/or the leaves of the grass plant over the summer time. Secondly, gray snow mold only occurs under snow cover, while pink snow mold can occur with or without snow cover. In most cases this disease kills the blade of the grass and not the crowns or roots. Gray snow mold occurs between 35° F to 50° F with an optimal temperature of 35° F. Heavy thatch can also play a key role in the formation of gray snow mold disease. Other factors that can contribute to this disease are light rains, heavy dew on the turf, overcast skies, fog and extended leaf wetness. Pink and gray are the most common of the snow molds and with both types of snow molds, the key factor that starts these diseases, is that snow covers the ground before the soil freezes. Both diseases can be managed successfully at home with simple cultural practices. Maintain adequate fertility levels in the lawn. A soil test can be done to see which nutrients levels need to be adjusted in the soil. During the season, water your lawn correctly. Try to avoid moisture stress (drought) and water at the optimal times of day. We recommend watering for 1 – 1 ½ hours per zone twice per week between midnight to 6 A.M.
Mow into the late fall (as long as the grass is currently growing) at proper mowing heights by keeping the grass blades at 3 – 3 ½ inches in length. If the grass is too tall going into dormancy, the matted down grass can encourage snow mold disease. Core aerate the lawn in the fall. This process not only reduces the thatch layer, where these diseases can harbor, but is also beneficial to the lawn in so many other ways (see our core aeration blog for more information). After a snowfall try to not pile up too much snow in one area. The longer the grass is under the snow the more time it receives zero sunlight and oxygen. 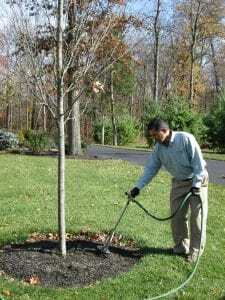 After the snow is melted and you can see the matted down spots, use a light plastic leaf rake to break the crusty matted down grass and gently “fluff” up the areas with the rake. This will improve air flow and growth. Winter is a harsh time of year and lawns that are infected with either type of snow mold disease are generally late to green up. The damage caused by snow mold is not usually serious. Applying fungicides in the spring after the symptoms of snow mold appear is of no value and will not help. But patience and a little bit of TLC goes a long way. If you are in our service area and have any questions about topics of snow mold disease, please give our office a call at 908-281-7888.